It may just look like a small white blob, but it’s my favourite small white blob ever. Can you work out what it is? As usual you can put your observations, comments and suggestions below and I’ll do my best to respond. Good luck! If it’s in a jar like that it must be something soft that could rot, and not bone. Maybe a kind of mushroom or fungi ? Not necessarily. We preserve vertebrates in fluid too if we want to see their soft tissue. There are also often preparations to show life-cycles, internal organs etc. So Paolo’s white blob really could be anything! Although there are things that it’s more or less likely to be! You’re right that it’s something that would rot if it wasn’t preserved in fluid, but this has hard bits as well as soft bits! Is it something that has a garden under the sea, where a singer might like to be? Mmmm, I think I saw something similar on your plate at Tapas the other week. Some sort of fungi? I have to say my initial thought was “ECTOPLASM! !” from one of those victorian mediums. My inital feeling was cephalopod, but would that really be your “favourite small white blob ever”? Not convinced. So I’m going to go slightly more left-field, suggest it’s somethign embryonic where the flesh has not been well preserved, and have a massive stab in the dark. Whale. Ooh, I like your reasoning – very good indeed! It’s not a Whale though. Yeah, was a very random guess! Is it an entire organism? Or just part of one? Something about its paleness makes me think of a tapeworm, which puts me in mind of “a ghastly parasite of some sort” (to use all zoological jargon), but the shape seems all wrong for that; it’s fat and bulbous rather than coiled and thin. Most things in jars of alcohol tend to end up pale, so don’t let the colour distract you. This isn’t really a parasite (although I suppose you could consider it to be a parasite of sorts in the stage of life that this one has been preserved at). As you say, the colour doesn’t mean much if its preserved in alcohol. Neither does the rather rugose nature of the thing – alcohol isn’t great for that sort of preservation. The clues you’ve given so far lead me to believe we’re looking at something foetal and vertebrate, so my guess would be that the main thing we can see is the placenta. Now… bottom left hand corner – would that be a head and paw I can see, or just a trick of the light? My guess is the former, which makes sense if we’re largely looking at placenta. Difficult to say what animal it is, but obviously something pretty small. A rodent, perhaps? You’re right about it being foetal and vertebrate, but there’s no placenta present – it’s all embryo. Don’t forget that it’s an embryo, so the size will depend on the degree of development! 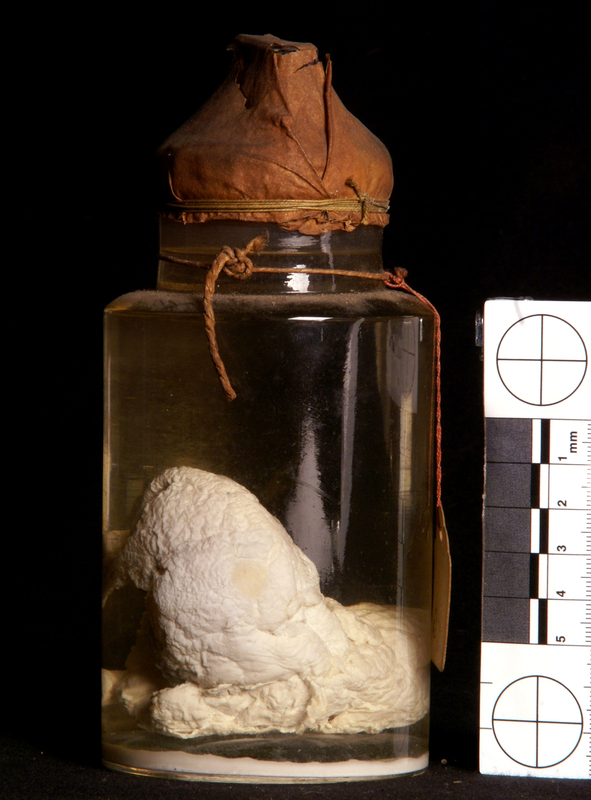 Either a sheep fetus or pickled cauliflower (I have a great recipe if anyone is interested). Mmm, a recipe for pickled sheep foetus? Sounds delicious!